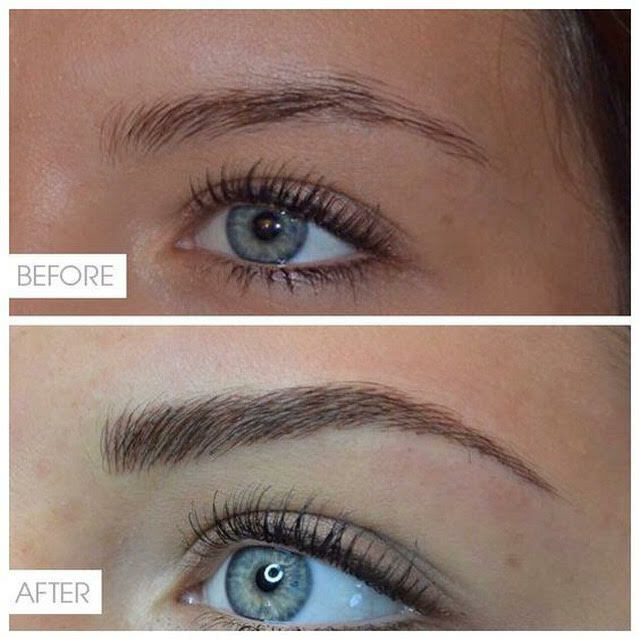 Microblading is a semi-permanent form of tattooing. It is done with a swiping motion of a manual pen and set of very fine needles, placing the pigment under the surface layer of the skin. The result is extremely realistic hair strokes. The strokes are fine, crisp with amazing definition and dimension. Microblading is a great service for anyone who wants to enhance his or her eyebrows. The results are natural looking hair-like strokes regardless of the amount of hair present. Whether you are suffering from a hair loss condition or simply aren’t happy with your existing brows, you will benefit from Microblading. Pigments are formulated to match your original brow color and blend perfectly into any existing hair. The result is a natural, fuller looking brow. 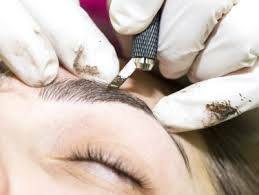 Immediately following the procedure, brows will appear much darker than the end result. The brow will fade significantly throughout the 30-day healing process. After the initial procedure, a touch-up is required to complete the service at the 4-week point in healing. This will ensure maximum retention and perfect shape. The microblading technique originated in China. After spreading throughout Asia, the technique caught on in Europe and new design styles were adapted to match with European tastes. Now the USA has caught on to this revolution in brow restoration! It is absolutely vital to educate yourself about what you should expect from a Microblading service. Remember you are about to change your face! It is difficult to predict how well the skin will retain the pigment, so it is imperative to have a touch up 30 days after initial treatment. Color and shape can be perfected as well as adding additional strokes if needed. Brows last from 6-20 months depending on a variety of factors. However, it is recommended to have a touch up once a year to maintain shape and pigment saturation. When Is Microblading Not For You? Clients on thyroid medication need touch ups more often as the color seems to fade more quickly. Blood thinning medications and supplements cause more bleeding during the procedure, making it difficult for the skin to retain pigment. NSAIDS (such as Aleve, Ibuprofen and Aspirin) and fish oil supplements are some examples of blood thinners. It is recommended to refrain from these within the days prior to procedure. Cholesterol and blood pressure medication can have similar problems. Although not blood thinners, these medications work against blood platelets sticking together. If you are on any medications, prescription or over the counter, that have been prescribed by your doctor do not stop taking your medication. Pigment retention is difficult but not impossible. It may just require more frequent touch ups as in thyroid patients, twice yearly versus once yearly. Diabetics are at more risk for infection, as well as other individuals with a compromised immune system or who don’t heal as well as someone without one of these conditions. A doctor’s release is required for a patient with one of these conditions. It is recommended that a cancer survivor wait 6 months to one year after the completion of treatment to get Microbladed. Accutane patients must wait one year after completion of the course of Accutane to have brows done. Microblading is fine to have done prior to Botox or filler injectables. If the patient has already had Botox or filler then Microblading is fine to do at least two weeks afterwards. There is potential that the outcome of the brow would be affected at the injection site so waiting two weeks helps ensure good results. It is recommended to not Microblade pregnant or nursing moms. There is no hard data on Microblading and pregnancy and nursing so erring on the side of caution is the best choice. The baby is the only thing that matters! Microblading cannot be done over moles or most scars. The pigment will not implant. Patients who have hypertrophic scars or keloid cannot get Microbladed. Concave scars, scars just beneath the surface of the skin, can be microbladed over but may need an additional touch up to retain the pigment. There are several skin conditions that effect how well the pigment implants. Oily skin, soborrheic dermatitis and eyebrow keratosis are all conditions that do not react well to microblading. The procedure can be performed on any of these skin conditions, however it is important to note that the service may not implant well and may require more frequent touch ups. There are several factors that affect the healing process. Keep these in mind and keep them away from the treatment area one week before treatment and during the entire healing process. Avoid waxing or other exfoliating services because it increases the risk of infection and can even create a wound or sore. Chemical peels, fruit acids, micro-dermal abrasion and lasers on the brow area will affect results, as well as retinols, glycolic and lactic acid. It is recommended to avoid the use of these things one week prior to microblading and 30 days after healing is complete. Sunlight and light therapy will also prematurely fade the pigment. Avoid excessive sweating for 9 days post treatment to limit risk of infection and increase pigment retention. Since every body is different, it is important to follow the instructions of your microblading professional. Your practitioner has your beauty and, most importantly, your health in mind when performing this procedure. These protocols have been put in place to heed optimal results. We want you to love your face! -Written by Jennifer Kopolow, an amazing Microblader, Laser Technician and Nail Specialist! Leave your thoughts on Microblading below and follow us on Facebook to continue learning about beauty and health issues.